The poet M. M. Shaffir (1909 -1988) was born in Suchava/Suceava (in Yiddish – “Shots”), Bukovina, Austria-Hungary; today – Romania. He immigrated to Montreal in 1939 and published 18 books of poetry. He was known for his love of Jewish folklore and his expert knowledge of the Yiddish language. He was a close friend of the linguist, writer and editor Mordkhe Schaechter, and visited him in the Bronx several times. At one of these occasions in 1974, the Sholem-Aleichem Cultural Center organized an event honoring his visit and afterward he sang three songs that he had composed at the Gottesman home across the street. In this post we look at the first of those three songs, a doina-style melody Shteyt in tul an alte mil. He included the words and music in his collection Bay der kholem multer (Montreal, 1983) which are attached. In Cindy Marshall’s film “A Life of Song: A Portrait of Ruth Rubin”, Shaffir can be seen in the episode where Rubin records singers in Montreal. The photo of him in this blog is taken from that scene. The entire film can be seen at YIVO’s Ruth Rubin Legacy website. 1) Shteyt in tul an alte mil. Veyn ikh dortn in der shtil. Veyn ikh oys mayn harts far zey. Ergets af a vistn feld. Hot zayn harts zikh opgeshtelt. hot a koyl zayn harts fartsikt. 4) Hot zayn harts zikh opgeshtelt. Ergets oyf a vistn feld. S’iz mir vind un s’iz mir vey. where I cry there quietly. and I cry my heart out for them. and a bullet devoured his heart. somewhere on a barren field. Woe is me, how it hurts! Recorded at a concert sponsored by the Center for Traditional Music and Dance, NYC, 1990. 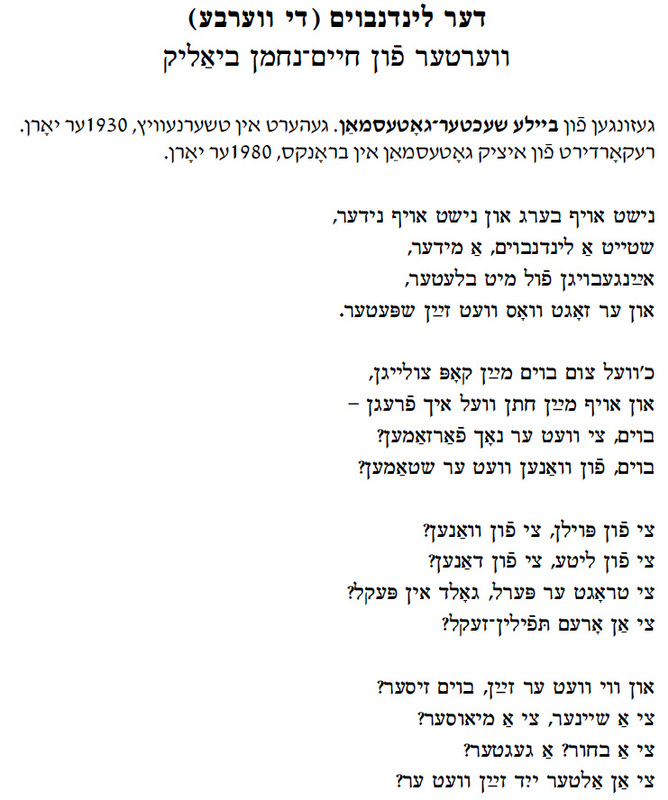 The lyrics to this song were written by the Yiddish/Hebrew writer Zalmen Schneour (1886 – 1959). According to Jacob Gorelik’s introduction the music is by the composer Samuel (Shmuel) Bugatch (1898 – 1984). Here is the link to the YIVO Encyclopedia entry on Schneour whose most famous poem/song is Margaritkelekh (Daisies). Jacob Gorelik at the Sholem Aleichem Cultural Center in the Bronx. 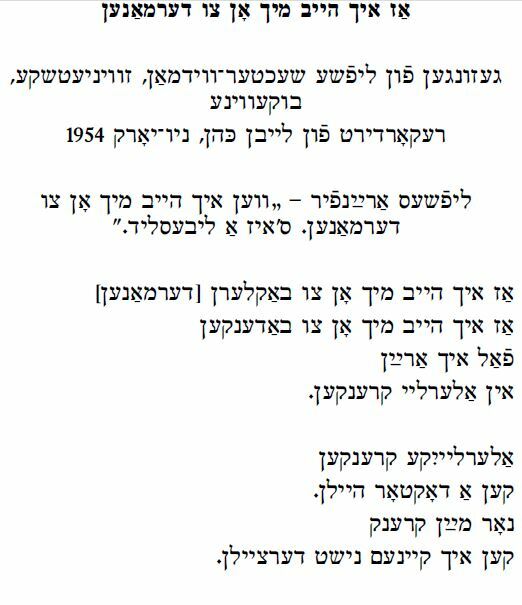 In Schneour’s volume of collected Yiddish poetry, 40 yor lider un poemen the poem is called Royte epl… and is dated to Vilna, 1906, one of his earliest poems (scan of that poem attached below). In the sound archives of the National Library of Israel it is sung by Rivke Glazman, recorded by Gila Flam in 1999. Both Glazman and Gorelik were close to the American Poale-Zion (Labor Zionist) movement as was Bugatch. Here is the link to Glazman’s performance (may require log-in) of Roye epl, grine shotns. Her interpetation differs markedly from Gorelik’s. Gorelik’s version, which we have transliterated and translated, differs, here and there, from the original. On the life of Samuel Bugatch, see this link at the Milken Archive of Jewish Music. Among his most famous Yiddish compositions are Zog Maran and A zemer (Reb Motenyu). gist zikh, trogt zikh fun der vaytns. Kum mayn meydl, malekh sheyne! un a gneyvish kush in nakn. un a drik tsum harts, a shtumen. un a shtiln soyd [sod] in oyer. grass – velvet, skies – silk. Come my girl, beautiful angel! The fruits tease us, the branches snap. and a stealthy kiss on your neck. and a quiet press to the chest. and a quiet secret in your ear. Feigl Yudin moved to the United States at the age of 14 from Grodna (Grodno) Gubernia, now in Belarus. Her parents stayed behind in Europe, so upon arriving to New York City she was housed by landslayt (contacts from her hometown), who took care of her until she was able to support herself. A skilled seamstress, Feigl continued working in the needle trades in the US for most of her life and was an active participant in the progressive labor movement. When the Center presented the landmark concert with legendary clarinetist Dave Tarras on November 19, 1978, at Casa Galicia (now Webster Hall) in Manhattan, Feigl Yudin was a featured artist, among others. 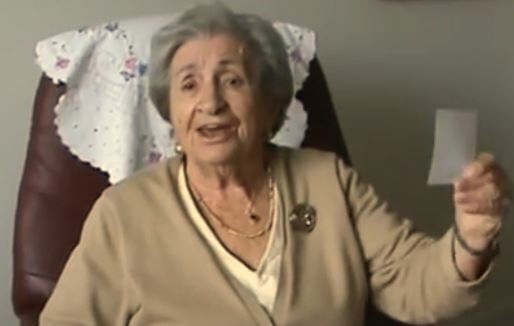 A native Yiddish speaker, she loved singing and was one of those people who could hear a melody for the first time and commit it to memory almost instantly. She would say, “When I hear a melody it haunts me and I must get the words.” Feigl had a large repertoire of Yiddish songs which she learned both in Europe and in the US, and, as you will hear, was a beautiful singer. This love song is a strophic lyric quatrain which is typical of the Yiddish tradition. (See accompanying booklet to LP Folksongs in the East European Tradition from the repertoire of Mariam Nirenberg Prepared by Barbara Kirshenblatt-Gimblett with Mark Slobin and Eleanor Gordon Mlotek, 1986, pages 5 – 6). Yudin’s repertoire was recorded by Ruth Rubin starting in 1948. Four of her songs are included in the volume Yiddish Songs from the Ruth Rubin Archive (2007) and her song “Ba a taykhele” begins the collection. It states there that the song was collected in 1967 and other versions can be found in I. L. Cahan’s collection Yidishe folkslider mit melodyes (1957) and the volume by Beregovski and Fefer – Yidishe folkslider (1938). The suggested parallel in Cahan (song #175) is not convincingly a variant of this song, but the Beregovski and Fefer version is the exact same as Yudin sings it, and I am inclined to think that Yudin learned it from an Amerucan leftist Yiddish chorus/choir where the songs from the Beregovski and Fefer songbook were quite popular. Bay a taykhele vakst a beymele. Mit alemen redstu, mit aleman bistu frayndlekh. (Haynt) freg ikh dir libster – ven vestu shoyn kumen? Ven vestu shoyn a mol kumen? Freg ikh dir libster ven vestu shoyn kumen? Leygst alts op af shpeter. By a stream a small tree grows. You talk to everyone; you’re friendly with all. But me – you ask to be silent. (Today) I ask you my beloved – when will you come already? When will come for once? I ask you my beloved when will you come already? But you keep putting it off for later. Currently on YouTube, one can hear “Bobe Chana” (Grandmother Chana) sing several Yiddish children’s songs, some less familiar than others. This week we present her song Di veverke (The Squirrel). 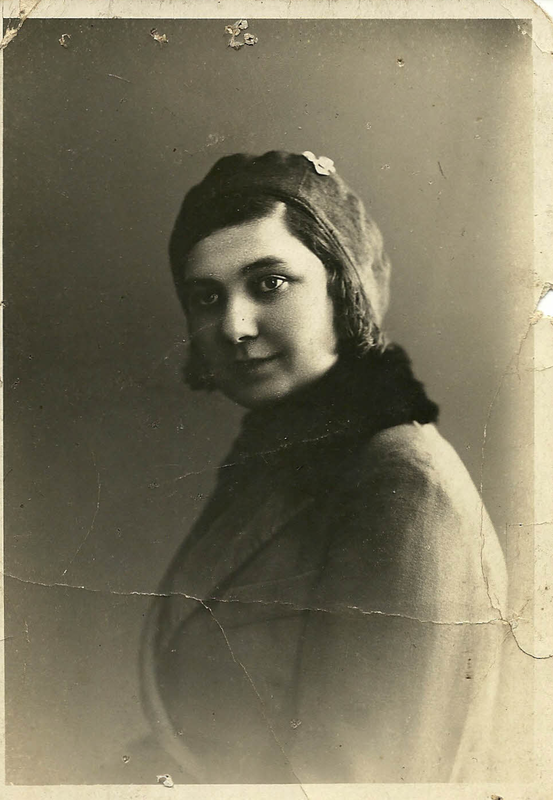 We obtained biographical information about Chana Szlang Gonshor from her daughter-in-law, the Montreal Yiddish teacher and scholar, Chana (Anna) Gonshor. Chana Szlang Gonshor was born in Warsaw in 1919 where her family was very poor. As a young child there she attended the Borochov school and attended the Medem Sanitorium at least 10 times. Anna Gonshor believes she learned her repertoire from these sources. She currently lives in Montreal. A video interview with Chana Szlang Gonshor conducted by Jordan Kutzik and Anna Gonshor for the Wexler Oral History Project of the Yiddish Book Center can be found by clicking here. 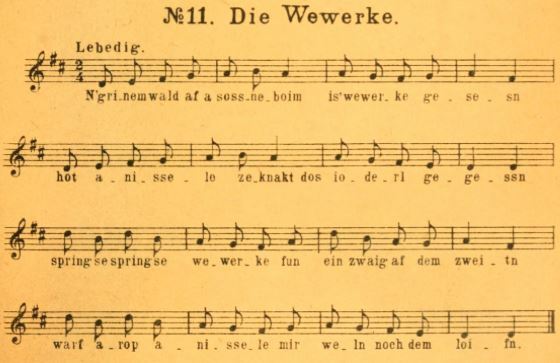 The song Veverke was composed, both text and melody by Rive Boiarskaia [Boyarski], and we are attaching the music as it is found in her song collection for small children – Klingen hemerlekh (Moscow, 1925). There are some textual changes as Gonshor sings it. The entire book can be downloaded here. Tants zhe, tants zhe veverke. and we will all jump. and began to dance with them. This week’s blog post – song and commentary – was submitted by Larisa Pechersky, who also performs on the recording. Thank you for giving me the opportunity to make my grandmother’s name known and maybe remembered by people who often ask me how I know so many Yiddish songs. I always tell them that it’s because of my grandmother. Now, I hope her story, name, and image will be shared with them for the first time. As always, I dedicate all my work in the field of Jewish folklore and education to her blessed memory. I learned this song from my maternal grandmother when I was a toddler in the late 70s . She lived with my mother and me, and took care of me while my mom worked. All day long, as she worked around the house, she sang hundreds of Yiddish songs and encouraged me to sing along. She would stop many times during a song to comment and make connections to her life in a Belorussian shtetl, to the experiences of her family and friends, and whatever lessons she wanted me to take away from each song. She often acted out the songs with me and showed me how to express a variety of feelings through a nign without words (just like in this song, Arele, she emphasized how the same nign after each verse can express fear, despair, or relief). She made each song a window into Jewish life for me, a child growing up in a big city of Leningrad, the cultural capital of the Soviet Union, where forced assimilation was the norm for its more than 150,000 Jews. Assimilation was out of the question for my family, where my grandmother wanted me to know Yiddish and grow up proudly Jewish. 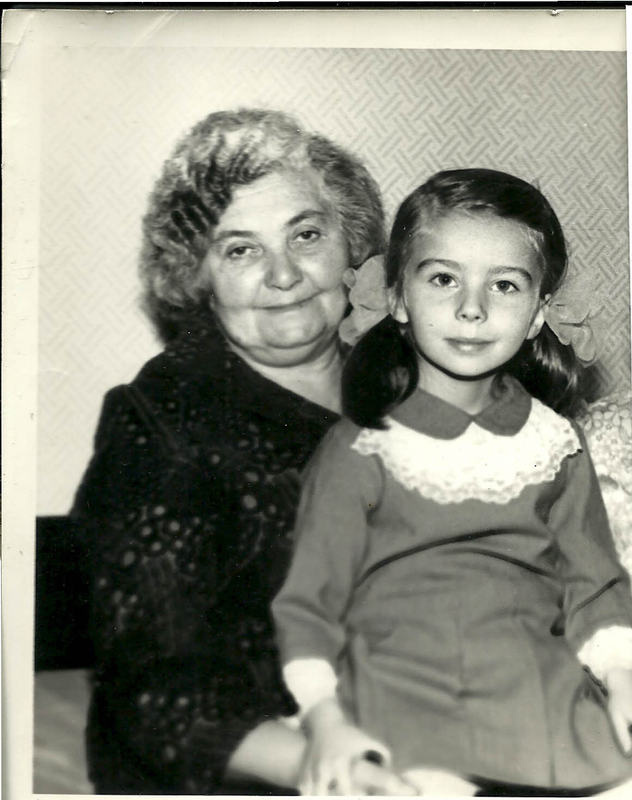 My grandmother, Milya Shagalova (nee Mikhlya Fle’er / Fleyer), was born in 1914 in Propoysk, a shtetl in Mogilievske Guberniye, Belorussia. In the post-revolution years, her father, Zalmen, received a warning that he was to be arrested, stripped of his possessions, and exiled for owning four cows and employing one housekeeper. To avoid this fate, the family fled to Horki, a larger shtetl in the region, his birthplace. As the third daughter in a family with no sons at the time, little Mikhlya was sent to a traditional all-boys kheyder to study. She told me compassionate stories of the cruel pranks the boys did to the poor old rebbe that she, as the only girl, felt so bad about. Later, she graduated from a seven-year school, where all of the subjects were taught in Yiddish. She wanted to continue on to the Jewish (Yiddish) teachers’ college, but it was no longer possible. In 1934, as a newlywed, she moved to Leningrad with her husband Naum (Nokhom-Abram), where they lived their whole life afterwards. Despite knowing Russian as well as if it were their native tongue, they always spoke Yiddish at home and with many friends, never missed a Jewish concert or event, and subscribed to Jewish periodicals when it was still possible. During World War II, my grandma miraculously survived the horrific siege of Leningrad with my three-month old mom, but lost her five-year old son, who was with his grandparents in Horki for the summer, during which the Nazis invaded it and killed 7,500 Jews, including the boy, his four grandparents, and 38 more of our relatives. My grandpa Naum, who came back from the front without a leg, learned of his son’s initial rescue, swift betrayal, and killing from his former neighbors. 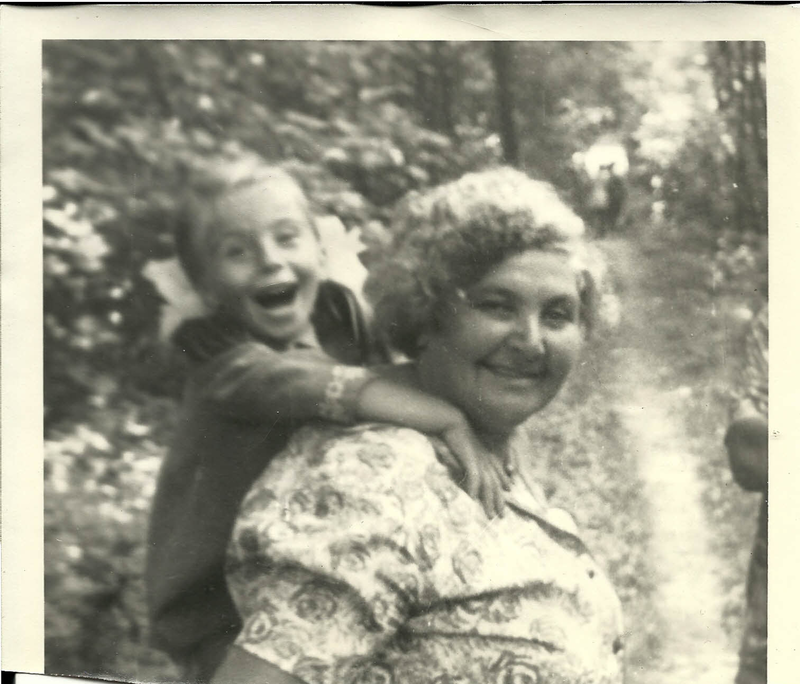 My grandma’s lament and guilt that she “sent her own child to death with her own hands” by letting him travel to Belorussia before the war “nobody expected to happen” was one of the stories that she would tell me often. When the Perestroika had just begun, the very first signs of the Jewish renewal were two concerts of Jewish music at the end of 1988 in Leningrad. My grandma did not miss them despite her poor health and the two of us went together. She felt that they “added seven more years of life” to her. This is how highly she regarded Jewish songs. To my greatest regret, she passed away in January 1989 before I went to synagogue for the first time and matriculated at the newly created Jewish University that same year. I never recorded any of her songs, but kept hundreds of them in my memory. I still remember some ballads, just partially, and feel terrible that I can’t recall all the words or find them published anywhere. When my friends and I started a Jewish school in Leningrad, I dedicated my work to giving my students the same as what my grandmother gave me – teaching them every and any thing Jewish through our amazing multi-layered Yiddish songs. Researching Yiddish musical folklore became my profession, passion, and a tribute to my grandma’s bravery and real heroism in passing our musical tradition to new generations amid the tribulations she lived through. This is how I remember learning the words as a child. I understand they sound not totally grammatically correct, but this is how I sang it as a kid. Most of the time, we sang the second and third verses in the reverse order. The line in question meant Arele wasn’t taken aback; didn’t fear (I don’t remember the Yiddish word). When it was sung as the second verse, it made his attempt to escape appear to be futile given the next stanza (he thought he could run away, but now he can clearly see the dire situation – the mouth, the paws, etc). This way the time between his climbing up the tree, crying in despair, and eventual rescue was much longer and more terrifying in his eyes. This was the order of the verses my grandma usually used. Switching the verses makes his actions appear more brave (he didn’t lose his head despite realizing all the details of the dangerous situation beforehand). Also, we sang it a bit slower, in a more storytelling manner, than I did in this recording.The English transliteration reflects the Yiddish dialect more than the Yiddish transcription. Dreyt zikh ‘hin un ‘her. Der ber mit lapes greyse! G’valt, dos iz nit gut! The bear with giant paws! Help, this is not good. From his eyes hot tears stream. and on the tree he climbs. Help, there is no rescue! 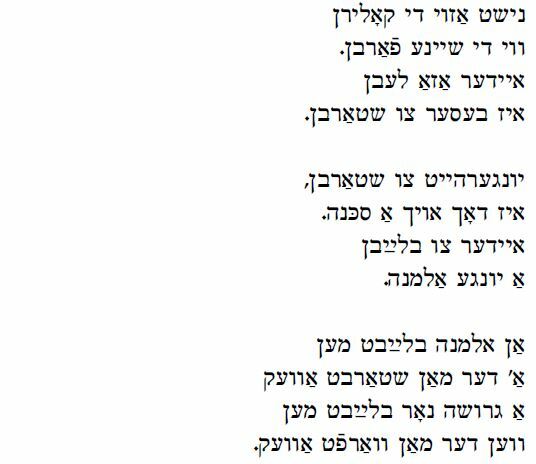 We have drawn on three sources to look at Lifshe Schaechter-Widman’s singing of Az ikh heyb mikh on tsu dermanen, a Yiddish woman’s song if ever there was one. 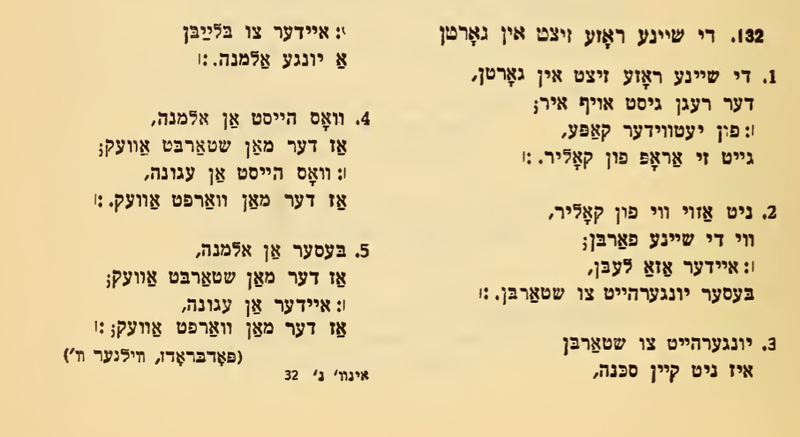 The wide geographic range of variants (see the notes to the song in Yidisher folklor, 1938), indicates that it dates at least as far as the mid-19th century. The song is a mediation on the tragedy of divorce/abandonment from a woman of the times’ perspective. 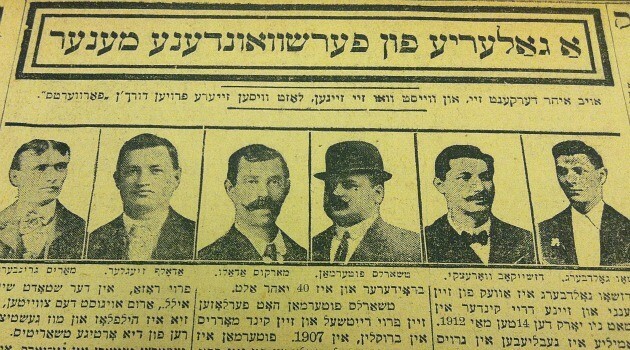 The Jewish Daily Forward newspaper in NY ran a column “Gallery of Husbands Who Disappeared” to track down men who abandoned their wives, leaving them “agunes”. The first source is the recording itself. 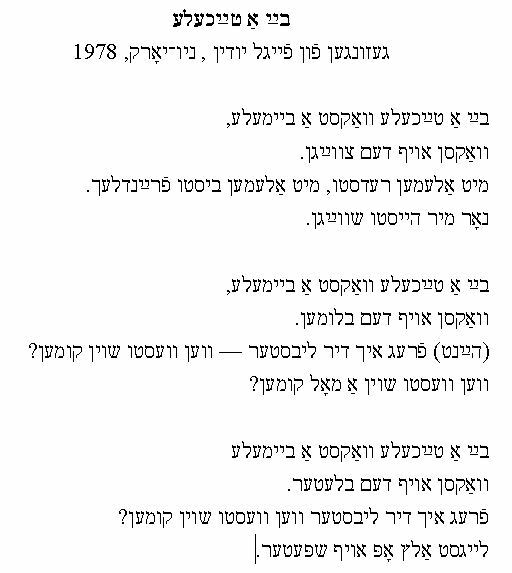 Since I also heard this song from Lifshe’s daughter – my mother, Beyle Schaechter-Gottesman – I have put Beyle’s alternate words in brackets and I believe those are the “correct” words: “dermanen” not “baklern”, “di blum” instead of “der boym”. Beyle learned the song from Lifshe and there are grammatical indications to support her version. The second source is the YIVO volume Yidisher folklor, 1938. Song #132 in that work is the same song but heard in Podbroz, near Vilna, Lithuania; quite a distance from Lifshe’s Bukovina homeland. 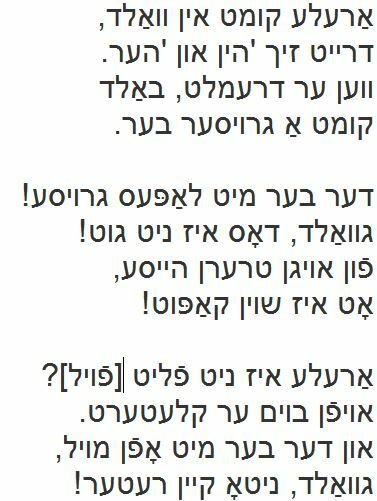 We have included the words and melody of that version in which the singer sings “di roze” instead of Lifshe’s “boym” and “agune” (an abandoned wife) instead of Lifshe’s “grushe” (a divorcee). My mother also sang “agune” and I believe that is how it was most widely sung. The third source is the Ruth Rubin field-recording housed at YIVO of the fine singer Bill Lubell (hometown unknown). We have not included the recording but have transcribed his words. In his performance a “woman’s song” has been adapted for a male singer. No longer is there a mention of “widow”, “divorcee” or “abandoned wife”. Without the build-up found in the woman’s version leading to the climactic description of an agune being discarded, the “man’s version” pales in comparison. In my mind, it does not take too much imagination to interpret the verse “The flower blooms in the woods – the rain falls on her – she then loses her color” in a Freudian manner. Az ikh heyb mikh on tsu badenken. fal ikh aran in alerley krenken. Ken ikh keynem nisht dertseyln. can be cured by a doctor. I can tell no one. Der reygn geyt af ir. The tree [flower] grows in the forest. The rain falls on it. it would be better to die. iz dokh oykh a sakune. A’ der man shtarbt avek. ven der man varft avek. 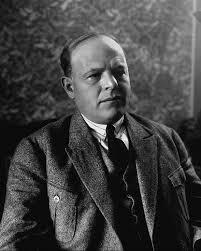 The text is based on a poem by the Hebrew-Yiddish poet Haim Nakhmen Bialik, written in Hebrew in 1908. 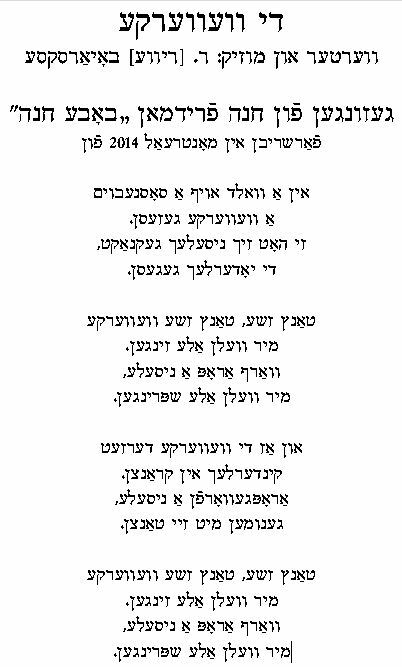 Apparently there were several translations of the poem into Yiddish, and in Chernovitz, Romania this is the translation that was used. Recorded in the Bronx by Itzik Gottesman, 1980s. Bialiks Di verbe hobn mir a bisl andersh gezungen. We sang Bialik‘s “The Willow‟ a little differently. shteyt a lindnboym, a mider. un er zogt vos vet zayn shpeyter. stands a linden tree, exhausted. and he says what will later be. Boym, tsi vet er nokh farzamen? Boym, fun vanen vet er shtamen? Tree, will he arrive (too) late? Tree, from where will he come? Tsi fun poyln, tsi fun vanen? Tsi fun Lite, tsi fun danen? Tsi trugt er perl, gold in pekl? From Lithuania or from here? Does he carry pearls, gold in his sack? Or a poor man‘s tfilin-bag? Un vi vet er zayn, boym ziser? Tsi a sheyner, tsi a miser? Tsi a bokher? Tsi a gegeter? Tsi an alter yid zayn vet er? And what kind will he be, dear tree? Not yet married or divorced? Or will he be an old Jew?